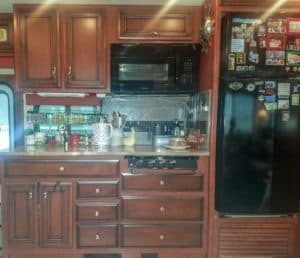 I am guessing that more than one of you may have wondered how small IS an RV kitchen & how do I make that work? 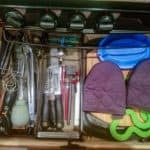 Did I have to get rid of all my favorite kitchen appliances, tools & gadgets? 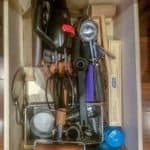 Can I store more than two plates, cups & forks? You will have to go to all plastic & a few microwave pots, right? Well, while that’s an option, but my answers, & the options, might surprise you. Basically a playhouse kitchen, right? Well, it is efficient & it gets the job done! How small is it? It is small…tiny, actually. 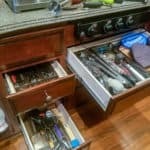 I did indeed reduce the number of appliance & tools that I have in my repertoire, for sure. However, I had too much to start with. I had too much stuff in my life period, as is the case with many of us. And if, like us, you have chosen to simplify your life & live tiny/ nomadic, you WANTED to get rid of a LOT of your stuff. MAYBE. I found purging easy. Some people do not. If you are a ‘stuff-lover’ (no judging) it’s okay; it will just take a little more intention. You may love your ‘stuff’ but at least the way I see it, you are choosing a life of freedom & adventure OVER a kitchen full of ‘stuff’. Right? Right! Let’s be real, a gourmet kitchen isn’t a necessity after all, right? Who needs a kitchen when you have a grill? I mean you live in a camper! What? Wrong! I mean grilling is good, but one cannot live on meat flamed over fire alone. This is not just my camper, it’s my home. Us food lovers must stick together. We have standards. 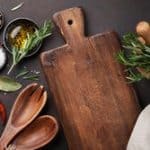 We want to still enjoy cooking & even eat good, real, creative meals, right? You have be able to sauté, chiffonade and to emulsify, naturally. And you might just need to roast something, toast something or even broast something! Duh! So, how do you prioritize & choose just the right items? Can it all fit? “Help Me!” you cry!! 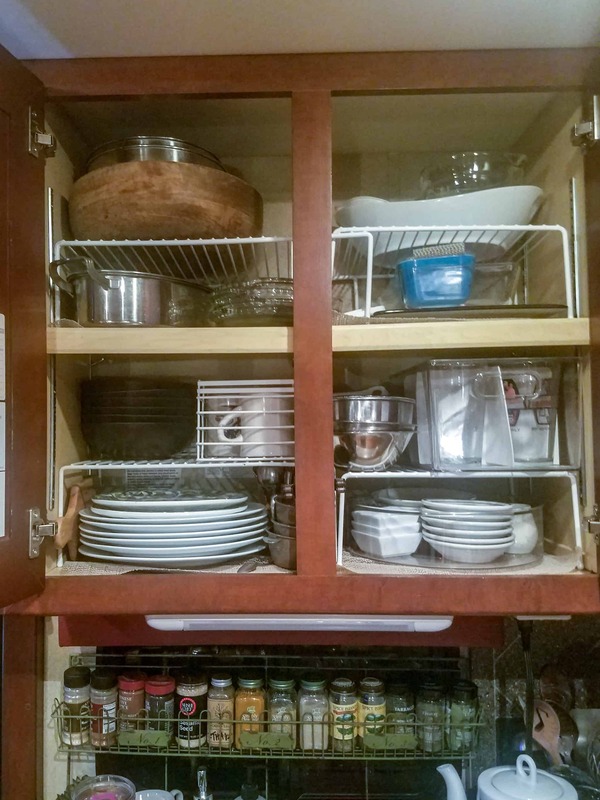 It did take some thought and reorganization of purpose & need, but I think I did a great job … I have a very aptly appointed tiny kitchen (nothing is perfect!) Let me share some of the basics of what I did. Gadgets & Gizmos —Whisks, spatulas, tongs, spoons, & a few fun specialty gadgets (pictured) Can you name what they are? I mean you need thermometers, skewers, zesters & crab crackers… no doubt! Then there’s the Pots & Pans … They are keepers! I kept my whole set of All-Clad pans AND I have several cast iron pans still too (not pictured) In the picture, you do see a cast iron garlic roaster … it goes on the grill & is a great tool! 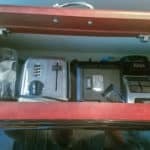 The Dishes – don’t forget the dishes! I did get stylish melamine bowls, but I kept real plates, bowls, cups, etc. All the necessities! AND I even made an ISLAND … it is movable, flexible & fold-able! It is food safe & it is SO CUTE!! 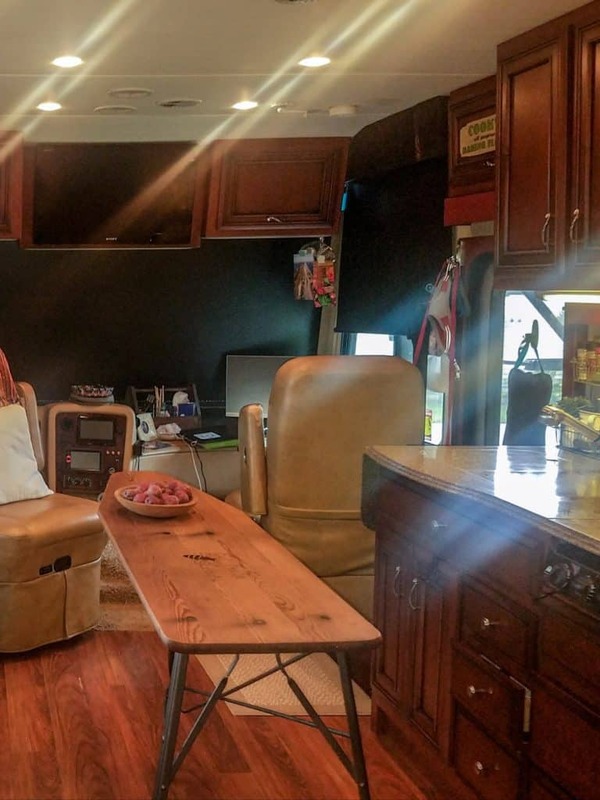 I call Anyway, creativity is Queen in an RV (or any small space! 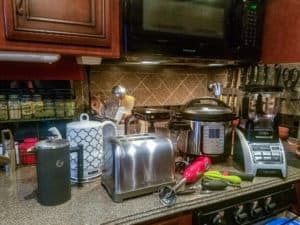 So, I know that I have scratched the surface here with an overview but never fear, I will be releasing some CHEAT SHEETS (January 2019) with an in depth look at not only what to consider (must-haves & options) for the kitchen but also how-to stock (but not over stuff) an adequate RV/tiny kitchen pantry. 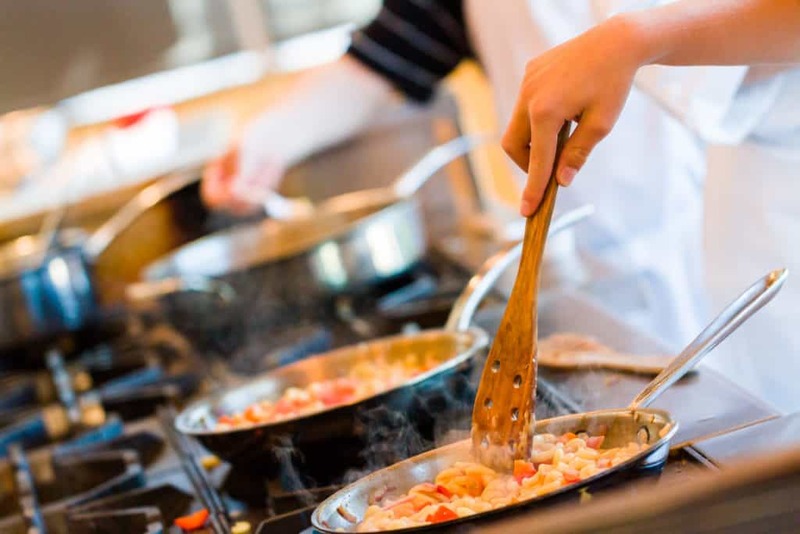 I also will be writing about HOW to cook great meals from a small space AND if you want more, I even offer on-line LIVE cooking courses where I spend time cooking WITH you & some of your (new) RV cooking friends! Next Post A 48 Hour Trip OR a 4 & 1/2 Month Journey? Saw your video on Freedom Week and was impressed. Found your site and enjoyed this article. As we are not on the road yet this will truly help with the planning. Look forward to exploring your world a bit more. Hi Teri! I am so glad you took part in FTFW … it’s such an awesome resource & there’s so much information that can be of so much help! Do you have an ‘on the road’ date set yet? Do you have your rig picked out? It’s all so exciting … we have not looked back! I hope you will be back to Cultivated Journey & know I am here if you ever have questions! We are in the process of resto-mod our 75 GMC Eleganza 2. 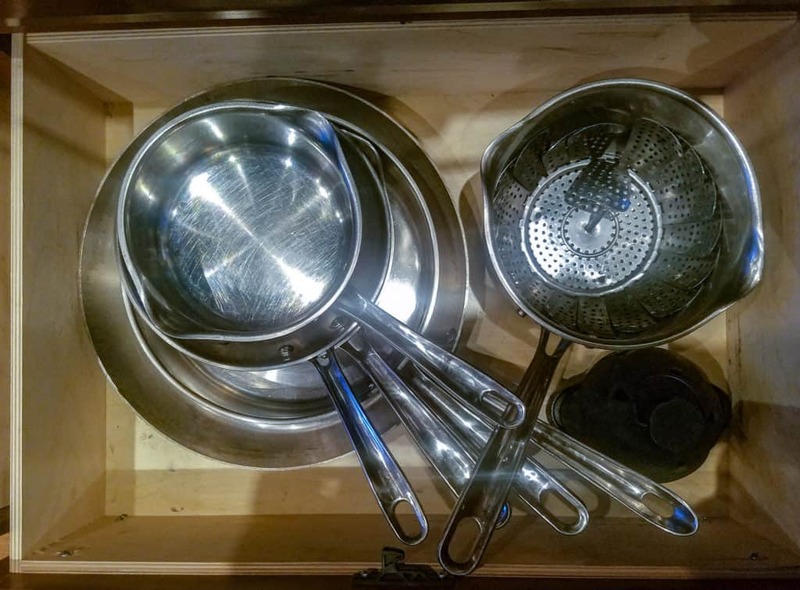 No basement storage and itsy bitsy kitchen storage. Finding your blog is perfect timing. I am so glad! Please reach out if you need to! I am happy to offer advice or cheer you on!! I will! I just bought a vertical silverware tray that I love even though I haven’t used it yet beyond putting it in drawer. I LOVE your Island Board , how smart and efficient. I look forward to seeing your setup as you get further along!